Have you ever received a “sign” right when you needed it the most? In the middle of struggle or suffering you thought you couldn’t bear, but somehow in that moment…something happens and you are able carry on? Those signs are Ho’ailona, messages from Spirit that can come in many forms. In 2004, my life changed forever. In the weeks before the passing of my beloved Kumu, Aunty Mahilani Poepoe, she had a diabetic ulcer on her leg that was not looking good. She had asked me to massage the leg, and I was not feeling comfortable with this as I felt it could spread if it was infected. She assured me that it would be alright and that she needed my help. Of course, I honored her request. On Wednesday evening, I was picking up Aunty Mahi for our weekly clinic. Aunty had a free “clinic” for over eight years that was held in brother Chucky’s carport. The community members would line up the driveway in their lawn chairs. Elders. Babies. Animals. 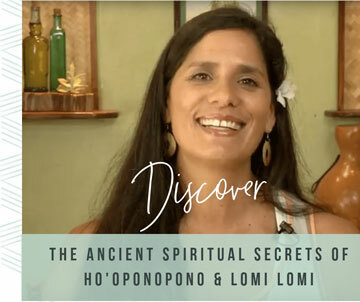 Everyone, to receive healing prayers, intuitive sessions with Aunty or Lomi Lomi from us, haumana (apprentices). We would work late into the night till every last person was seen. This was one of those Wednesday nights and I arrived at Aunty’s Wailuku apartment just like every other week. I knocked on the door. No answer. I looked in the window and saw her sitting at the edge of her bed. I called to her, but she didn’t answer me. She was moving her lips, but I couldn’t understand what she was saying. I finally got inside, but I could tell that something was wrong. Auntie was mumbling and told me she had the flu, but I knew there was more. The ulcer had gone septic and was already attacking her organs which were shutting down. I helped her to the restroom and on the way back, she fell into a coma. We called the ambulance and she ended up in the hospital. All the haumana gathered to hold vigil at the hospital. Friday night, I left the hospital to shower and get a few things from my home in Kihei. On my way back, there was a pueo, owl. It was flying right towards my car! It came so close to the windshield, I could see it looking me straight in the eyes before it flew up and over the window of my car. I raced to the hospital because I thought maybe something had shifted for Auntie. On arrival, I could feel a definite difference in the room. Her spirit had taken flight. I knew then, the Pueo was her way of telling me that she was beginning her journey to the after place. I believe the message came through this owl because Auntie was still in the coma. A few days later, after the family had had enough time to come hospital and have their last moments with Auntie Mahi, they pulled the plug on the machines that were keeping her alive. We did a ceremony at the hospital that day out in the court yard. When Auntie Lei’ohu Ryder finished her prayers, sending Auntie Mahi’s spirit, a huge whale appeared in the sky. A big, humpback whale in the clouds. It was unspeakable. Breathtaking! I took the sign to mean that Auntie had joined the wisdom keepers on the other side. The keepers of all the stories of the ages, because that’s who she was. Auntie Mahi was a keeper of wisdom. It was not the ulcer that took Auntie. This was just the vehicle for her to get to the other side. As a wisdom keeper, people could be intimidated by Aunty. Although she delivered her teachings with grace and aloha, she spoke up to those cultural advisors who were lining their pockets with developer kick-backs instead of taking the responsibility to protect and preserve our ‘aina (land). She cautioned those disseminating cultural information that was not quite correct. She wanted to help teach and empower them. But many felt threatened by the light of knowledge that she carried instead of seeing her as a valuable resource. One of the these cultural practitioners within her own family directed an energetic arrow towards Aunty. That arrow manifested in the form of an ulcer. Auntie was Kahuna. She knew the old style of returning these energies back to the sender. That action would have put an immediate end to her physical pain. This was not her way. Aunty Mahi was all about unconditional love and compassion. Instead of perpetuating disharmony in her family line, she took that arrow with her to the after place. By doing so, she brought healing to her family line. She was a living example to us us haumana of this energy of unconditional love both in life and death. When I began my journey home from the hospital that night, out over the ocean near Kihei, I saw the most spectacular light show I had ever seen in my life. Far out above the sea, behind the clouds, there was lightning flashing. Lightning bolts of rainbows, dancing across the sky. I’ve never seen fireworks like I saw that night. The light show was more magnificent than anything created by man. It was a welcome home for Auntie. Angels and ancestors dancing in all of their regalia, welcoming her home for a life well lived. A life of service, love and compassion to all those around her. The owl has come to me many times since then, and I know it is Auntie Mahilani. She has chosen to guide me as aumakua, a spirit animal in the form of a pueo. There have been times where I really needed to pay attention. She wants to make sure I remember that she’s watching over me and all of her haumana, the apprentices she chose to carry on her teachings. I am incredibly grateful for the messages, the ho’ailona, that continue to help me feel close to her. They help me to remember to pay attention in every moment to the signs all around us, all the time. The ho’ailona help me to remember to live by her example and strive for the same loving compassionate life that she exemplified. If you’ve read this far, I thank you. Has an sign or message come to mind? Feathers. Butterflies. Flowers. Winds. Something else? I hope you feel inspired to live each day with love and compassion allowing the signs to inspire the kind of connection that supports your journey. These messages are personal, and made for you. Ask for the guidance and then listen to the answer. Allow it to come from within. I invite you to share your experience with our Ho’omana ‘ohana. I read every comment and question…you mean the world to me!